When tourists think of Taipei, I think its pretty safe to say that the city’s Neihu District (內湖區) isn’t really a place that attracts many of the city’s visitors. The district is most well-known for its technology park and its giant shopping centres rather than its cultural or tourist attractions. Things are changing however and Neihu is quickly becoming one of the most attractive residential areas in the city with beautiful parks, great shopping and an excellent public transportation system that allows residents to get back and forth quite easily. In the past a lot of these places were somewhat inaccessible to tourists visiting the country but now that Taipei’s MRT system runs through the district, the U-bike public bicycle share system is available and the public bus system has been refined, it is much easier for people wanting to visit some of the sights that are available. Neihu has its fair share of beautiful parks for families to visit, mountains for hikers to climb, temples for the religious (and people like me who think they’re cool), historic buildings as well as great shopping, fine dining, small night markets and of course a giant Ferris wheel that gives great views of the city. The Neihu Red House (內湖紅樓) which is conveniently located next to the Taipei MRT’s Wende Station (文德捷運站) is celebrating its one hundred year anniversary this year. Originally the home of Neihu Village’s mayor Kuo Hua-Jang, the building was designated a historical site in 1999 by the Taipei City Government. The Kuo family came to Taiwan in 1690 from China’s Fujian province. The family was quite well off which allowed for the family of merchants to turn into a family of scholars with several members taking the Imperial Examinations and achieving the rank of “scholar” (秀才). One of those scholars was Kuo Hua-Jung (郭華讓) who in 1920 became the first official mayor of Neihu village (內湖庄) and served two successful terms. As mayor he was well known for his successful infrastructure projects which include the construction of bridges, roads and public water service. As the Kuo’s were a family of accomplished scholars, they naturally built their residence next to a school (Today’s Neihu Senior High School) and in 1917 construction commenced on what we now call the "Neihu Red House" (內湖紅樓) but is otherwise known as the Neihu Kuo Family Ancestral Home (內湖郭氏古宅). Today the Red House is known as the (Guo) Kuo Ziyi Memorial Hall (郭子儀紀念堂) and is dedicated to Kuo Ziyi (郭子儀), an ancestor of the Kuo family who lived lived between 697 and 781 and was known formally as Prince Zhongwu of Fenyuan (汾陽忠武王). Kuo was an accomplished Tang Dynasty (唐朝) general who is most well-known for ending a rebellion and participating in expeditions on behalf of the emperor against the Uyghur’s and Tibetan’s. Once regarded as the most powerful general in the empire and was regarded as the person who single-handedly saved the Tang Dynasty from destruction. 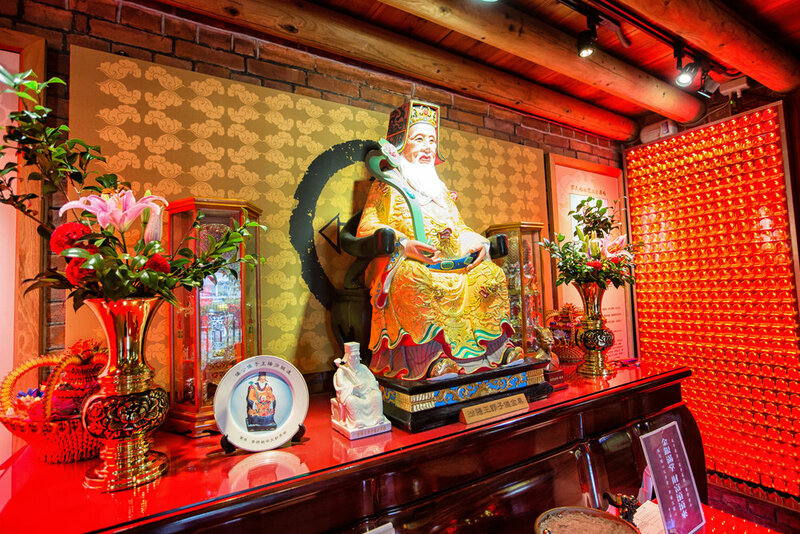 Today the Neihu Red House has changed its role as a mansion to an ancestral shrine dedicated to one of the most influential members of the Kuo family. The main hall has a shrine dedicated to Kuo Ziyi and the rest of the building acts as a memorial hall for both Kuo Ziyi and his good friend, poet Li Bai (李白) featuring displays of his poetry and his calligraphy. Originally constructed in 1917, the two story south-facing red-brick home beautifully puts baroque architecture (巴洛克式風格) on display. As I’ve mentioned in several blogs already, especially those about the Daxi Old Street or Hukou Old Street, baroque is a style of architecture which was extremely popular with the wealthy of Taiwan over the last two centuries. Baroque was an architectural style that originated in 16th Century Italy and spread throughout Europe and then eventually here into Asia through colonialism. The style is said to promote dynamism or a sense of motion with strong curves and beautifully sculpted decorations on the surface or the facades of buildings. Here in Taiwan, Baroque was introduced in the early 19th century when the Japanese took control of the island and promoted modern construction techniques. The fusion-style architectural design was supposed to differentiate the buildings of the colonial era from those of the Southern-Chinese architectural style that was most common prior to their arrival. Baroque design quickly became popular with the wealthy and higher educated members of Taiwanese society who preferred to build their homes and businesses with not only modern construction techniques but also the fusion of both Western and Eastern design which would have been considered great for their reputations around town. Today there are still quite a few well-preserved buildings of baroque-origin throughout Taiwan - If historical design is one of your things you are certainly in luck when you visit as there are tourist streets full of this type of architecture in addition to buildings like the Presidential Palace which are all great examples of this style of design. The 100 year old house is a 130-ping (426m²) two-story building with a courtyard area that is over 360-ping (1178m²). The exterior of the building is constructed entirely of red-brick with washed terrazzo and coloured tiles which were imported from Japan while the interior is made of beautiful Taiwanese cypress (檜木) that shines when the sun when the sun comes in through the windows. The front facade of the building is where the baroque style is most prevalent. The windows on the front of the building are irregularly shaped with a curved balcony on the second floor, twelve beautifully designed tiles on the sides and two plaques on each side of the doorway. The top gable of the building is where the design is the most beautiful with an ornamental western-style flower wreath wrapped around the Chinese characters “汾陽” (fenyang) and the date for which the building was constructed. The gable is one of the most common characteristics of baroque design in Taiwan and the restoration project that restored the building did an excellent job paying homage to the original design of the gable which after a century is still protected by stone lions on the top. 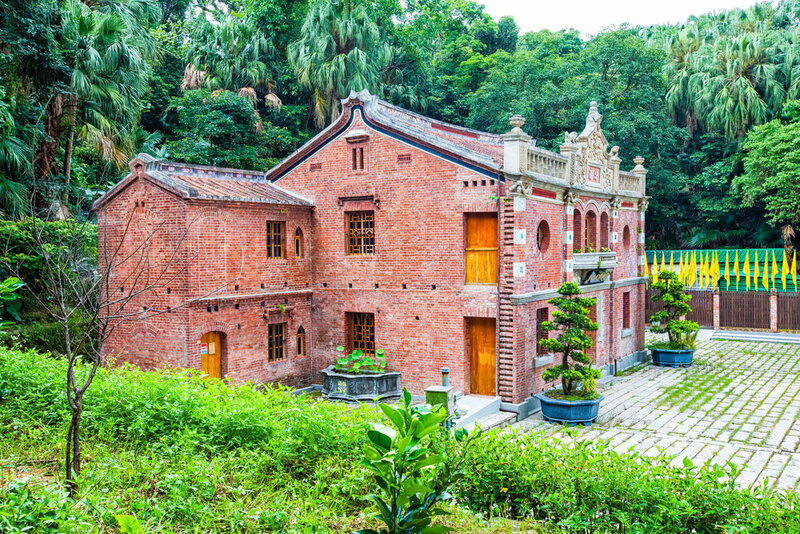 Despite receiving recognition from the Taipei City Government as Historic Property in 1999, the Red House remained abandoned and was in a dilapidated state until 2010 when the Kuo family got together and raised funds to restore the building. The family raised over $30 million NT to contribute to the project (1 million USD) and the Taipei City Government shelled out $10 million NT (300,000 USD) of its own to help restore the building. With the funds in place to start the project the building underwent a year-long facelift under the watchful eye of a master craftsman who specialized in the restoration of historic properties - and who also happened to be a member of the Kuo family. Before the restorations started the Red House was probably one of the coolest historic properties within Taipei city limits for Urban Explorers searching out abandoned buildings. Photos I’ve seen of the house before the restorations started make me really wish I knew about the house when I first arrived. I would have loved to have seen it in its dilapidated state as the house was completely taken over by nature and almost faded into the mountain behind it as it had trees and brush growing all over it. A year after the project started the building reopened to the public and was renamed the Guo Ziyi Memorial Hall as the family wanted to memorialize an influential ancestor. From the photos I’ve seen of the building before the project started, I’m actually quite surprised that it only took a year to complete. There was a lot of work to do and restoration projects of this size usually take a considerable amount of time here in Taiwan. Visiting the historic Neihu Red House is extremely easy now that the Taipei MRT services the Neihu District of the city. Simply take the MRT to Wende Station (文德捷運站) on the Brown Wenhu Line (文湖線) and leave via Exit 1. Once you are outside the stairway to the house is almost next door. You can’t miss it. The house is open to the public from 10am to 5pm everyday except for Mondays and entrance is free of charge. As the Neihu Red House is currently celebrating its centennial, it is a great time to visit to enjoy a bit of Taiwanese history. If you’re into architecture, design or history you’ll really enjoy a visit to the building as the craftsmanship that went into its construction is quite amazing. You don’t need a whole lot of time to visit the building and it won’t take you very long to get there as it is an extremely convenient place to visit. If you’re in Neihu visiting the Moon Bridge or hiking one of the many mountains, you’ll probably want to stop by and check out this beautiful old building.